"With the advent of the "Palestinian cause" becoming chic in Western, European, and Liberal circles being infected by virus has once more become acceptable to exhibit socially." Anti-Semitic drawings and the San Francisco anti-circumcision campaign Zombie illustrates that an anti-Semitic cartoon has been pressed into service in the San Francisco fight to ban circumcision. It was only a matter of time. Antisemitism is not a sign, a symbol, a bullet or a gas. It is a Virus. It is the oldest known virus to infest the human soul. In those infected, the virus is clever enough to mask it's existence by renaming itself as "anti-Zionism." Through the renaming of this ancient disease as a “political problem,” infected souls can transmit the virus to their friends, families. They can spread their disease at their schools and in their their community, church, or nation. The virus is also transmitted by exchanging infected fantasies with infected ideologues. By changing it's name the disease made it possible for many to deny that they have contracted the virus, and that their souls are chancre-ridden and rotting. This facilitates the current outbreak. Yes, antisemitism is a clever virus and this shape-shifting is one of its oldest methods of perpetuating itself. Like other viruses currently feasting on humans, this one always has a pleasure principle associated with it. It feels good to get it and we live in the plague years of "If it feels good, do it." Those whose moral immune systems have been previously compromised by other pleasure-born diseases have souls which are particularly susceptible to this virus. The origin of the virus is unknown, but many suspect the area to be Bablyon and Sumur with an early leap across borders into Egypt. It was later transmitted through not-so-casual contact to much of the world by traders out of Northern Africa and the Roman Empire. During the period following the fall of Rome, the virus found traction in early Christianity as a common carrier. In this host it thrived, and was able to survive and spread for many centuries. Of late, many parts of Christianity, now that it has become fragmented, have rejected the virus and those who host it, but strains of the virus can still be found at the center of many subsets of the Christian faith today. Islam, of course, is the not-that-new major religion to not only host the virus, but to celebrate being infected with it, and to actively take measures to make sure that, within the body of Islam, the virus can thrive and expand. What to do about this new and virulent strain of the virus is something that is now consuming a great deal of the attention and treasure of Western Civilization. In the past, treatment of the virus involved the application of large amounts of steel and fire, but this age is still experimenting with targeted surgery of the infected parts of Islam to see if a less Draconian cure is possible. Recent events confirm that this sort of microsurgery will probably be ineffective since the virus seems to have become the host. Flare-ups of the virus have been common across Europe throughout the last 2 millennia, but an overwhelming series of eruptions in Europe from England through the lands controlled by the USSR, required a global intervention before the conflagration was deemed to be put out. This, of course was an illusion, since like the root burns engendered by forest fires, it only smoldered underground in the human and social hosts for decades before erupting once again in the vast Petri dish of the Middle East. With the advent of the "Palestinian cause" becoming chic in Western, European, and Liberal circles -- driven at first by Socialist Progressive romanticism in the late 1960s and early 1970s -- being infected by virus has once more become acceptable to exhibit socially in certain ways. Indeed, in many circles and societies, having the virus has lately become a highly prized fashion accessory to popular academic, media, and state ideologies. It is now actually a badge of pride in many Western circles to appear at various events wearing gold-plated buboes inset with multi-faceted Kaposi's sarcoma that contain the virus at their core. Many now believe this intellectual adornment to actually be beautiful. In a recent mutation, the virus has shown that it can leap the blood/brain barrier and actually infect Jews -- if they feel safe within their "advanced" society. 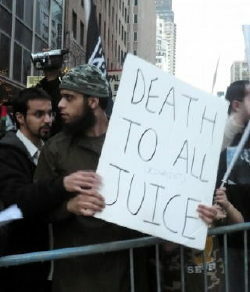 The current term for this mutation is "Juicebox Mafia" in which self-styled "intellectuals" of Jewish lineage actually feel it is "intelligent" to call for a world in which it is easier for Arabs and other Islamic groups to kill Jews wholesale. This sort of strange host to the virus is replacing the previous host termed "the self-hating Jew." The reason for the rise of the Juicebox Mafia is unclear, but it may well have to do with desires for celebrity and paychecks that exceed the desire to live. The virus, because it is an ancient and clever virus, can lie dormant for years, and like HIV, can mutate around a lot of therapies designed to destroy it. As noted above, in the recent past, it has been shown that large doses of steel and fire can eradicate the virus in some populations, but only for a time. A cure is promised, but seems to be always delayed. The only measures that work are, at best, prophylactic. Another strategy is strict monitoring to prevent the spread of the virus. This seemed to be holding the virus at bay for decades. Lately, however, this method has broken down. The virus, like terrorism, has recently been able to piggy-back on the world-circling data-stream, and infect individuals and groups previously deemed immune. The current strain has indeed become so virulent that large blocks of Jewish people, in Europe, America and even Israel, have become infested. As history demonstrates, there is no immunity to be had from the virus. The only strategy that seems to work is abstinence. This is accomplished by a rigorous rejection of all attempts by the virus to establish itself within an individual host. Constant monitoring and the suppression through education or other means of outbreaks in groups or ideologies or nations is also required. Since the virus has been present in human hosts for well over 4,000 years, hopes for eradication in our lifetime are slim. Hopes for eradication in the future are better in civilized countries if, and only if, members of the generations now living and infected with the virus become dedicated to not passing it on to future generations. The virus is found nowhere else in nature except within the human host. If it is denied transmission to the young, it can be eliminated from the world in three generations. If... but only if. Excellent writing about a depressing reality. It is the best observation of anti-Semitism that I have read in some time. I began formulizing my case at the beginning of this month for why both Christianity and Judaism are in for a rough time. * I pointed to a reason that even Dennis Prager (author of Why The Jews) admits he'd overlooked in that book. Key elements. Abraham, in revolting against pagan practices (human sacrifice), established the core ethos of the modern creeds: elevating innocent human life to a sacred plane. Believe in life, not death. My interpretation: have faith in boundless human resourcefullness not fearful of limited (dwindling) natural resources. It is my hypotheis that those who do not cherish innocent human life (or would have a differing view of what constitutes innocence) never forgave Abraham. Those like them will be most hostile to any who carry on Abraham's idea. I make the case (in a way I am not quite satisfied with yet**), that those who have most embraced post-modernism are not only not hostile to radical islamic death cultism, but are actively helping it. Many of us do want to accept this, but I believe it is an unyeilding logical consequence to the rampant pessimistic outlook for humanity that has been inculcated by the West's counter-culture. It certainly is consistent with the nihilistic strain that Stephen Hicks Explaining Postmodernism identified as one of Postmodernism's three key elements. *Also Anti-Americanism as I lamented in January. ** My front page version is still being edited, while the link above is over a week old now. sorry, looks like I couldn't make up my mind whether to write formulating or formalizing, and didn't catch it until now. Kip: A study of the writings of some very highly placed Catholics from hundreds of years ago shows the kind of hatred Gerard discusses. And while it is true that mankind always has persecuted the "other", that otherness has been related to different characteristics at different times - color, language, diet and other cultural markers - EXCEPT in the case of the Jews, who have always been persecuted for their Jewishness. It has indeed been a fanatical philosophical hatred for a very long time. If only hatred of the chosen people was a newer blight on the planet, we would have a better chance of irradicating it. Probably not politically correct to say so, but the virus is also spread in baath houses from Syria to San Francisco. Speaking of a virus of the soul.... Note that the man in the photo is sporting a "soul patch" (which here functions as a Hitler moustache appearing along the lower, not upper, lip). So-called "culture" (Western, American, secular - what-have-you). I would have said "goy baath houses." The guy in the picture looks like Liza Minneli's last husband. It's 1935 and two men in Berlin are listening to Hitler rant against the Jews. One says to the other, "Very interesting, but I prefer it in the original Arabic." Why, its just not fair that God would choose a people for His own. Exquisitely said, Gerard. Would that it falls upon a receptive ear or two. I will freely state, here and now, that I am anti-Semitic myself. Why should I want to admit that? 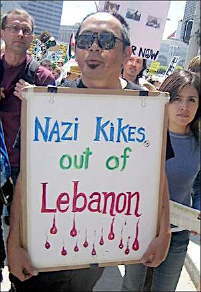 Arabs are Semites, too. And they are the ones that I am "anti-semitic" towards. Cute, but the term "anti-Semitic" has nothing to do with the "semites" as understood by anthropologists. The term "anti-Semitism" was coined in the XIXth century by Jew-haters who wanted a more "scientific" sounding cognomen than "Judenhass." Virus source: R&D Department, Hell. Only known cure: Blood of Christ (applied daily) WARNING: Self-application only! Any other application results in spreading the disease. "If it is denied transmission to the young, it can be eliminated..."
Kill the first-born of Mohammed? Actually, there are Anti-Zionists who are not also Anti-Semitic. I know this for a fact because I met both of them in 1979. Hunt down and kill juice boxes. Ok. Sure. I don't quite think that's what he meant. Soooo, where'd you get the shot of oblowme with the Cryptkeeper? A phenomenally well written article, concise, almost brutally honest and untainted by timidity or "PC" Bravo Sierra. My Jewish friend in the USA all voted against Obama, but none of them could grasp why so many Jews apparently voted FOR a man who is an unabashed hater of Jews, Israel and all things related. As for the muslim virus, there IS indeed a cure but it will take someone whose love for generations yet unborn, will give them the dauntless will to carry it out. The cure for islam can either be measured in millirads or megatons. Preferably the latter. Actually, Antisemitism is a reaction to a virus. Even its word structure shows 'reaction' in anti. It is nonsense to think that 'antisemitism' rises magically in countless societies isolated from each other in time and space. It is a part of the fantastic world of Jewish Intellectualism, that antisemitism can not possibly have occurred in REACTION to what Jews were doing to their neighbors. Antisemtism is more like the white blood cells that come to combat a virus which has attacked a healthy body. That is a far more accurate picture of what has occurred historically. Antisemtism has always arisen in reaction to actions of the Jews when they try to take over the society that has given them refuge. Whew! I was afraid that we might not hear from the Jew-hating, Nazi lunatic fringe, but "Spudd" showed up to speak for them all. And I say that in a manly sort of way. I am a practicing Catholic. (admittedly not a very good one, which is why I need all the practice I can get). I have a young Jewish female colleague, who broke away from the family political liberal mold and is a somewhat socially liberal, but fiscally conservative, Republican. (She volunteered for the Giuliani campaign in 2008). We sometimes have philosophical discussions on religion, politics, etc. She knows I am far more conservative than she is, and that I am a gun-toting, concealed carry, Second Amendment freak - which she finds both comforting (we are in a very small office) but also kind of disturbing. (What do American Jews have against guns? I can't figure that one out). Anyhooo.....(so get to the point already, Jim)....one day, she was telling me about some book that this Rabbi guy, I think his name is Kushner, wrote (not the "why bad things happen to good people" book which he also wrote, but a different one). Apparently, in that book, the author talks about being at some social event with a group of Jewish couples...and the holocaust came up, and somebody said -- -- "If the Sh-t ever REALLY hit the fan for us in the USA, like it did in Europe in the 30's...does everyone know a Christian family who will hide them?" It silenced the room, as the couples contemplated that awful hypothetical situation. She looked directly at me...and she KNEW damn well what I was going to say next, (which I found extremely flattering) but before I could open my mouth she said...."my parents and I could not possibly expose you to that risk." My response: "That is not for you to decide." How far down this growing anti-Jew slope are we going to keep sliding, over the next 5-20 years?? Because there is NO doubt that it is growing. Is it going to bottom out? Or is there a risk (however slight it may appear) that it does not bottom out until we get to a nightmare situation? I don't know. All I do know is that unlike folks like Corrie Ten Boom and other Euros who tried to protect the Jews in the last century, millions of us are armed. This bullsh-t will either recede....or it will get worse. And it will not end well. Proving for once and for all, as if further proof were needed, that Nazism is National Socialism, and that its antisemitism was not an optional feature, but was, and still, is a core part of all socialism. For those who do not understand the debased and degraded language of politics in the United States here in the early part of the 21st century. Here is a guide. In 19th century a liberal was a person who believed in free minds, free men, and free markets. Such people are now called libertarians or conservatives. If our liberals were at all honest, they would call themselves socialists. Sometimes, they call themselves "progressives". They do not, however, believe in progress, to which they are stoutly opposed. They do identify with the upper class socialist movement of the early 20th century which called itself progressive, but which was really socialism with a nasty dose of class and race based condescension. The condescension is shared by progressives ancient and modern, as is socialism. The Democrat party was founded by southern planters and was rooted in liberalism, states rights, and slavery. In the 20th century it embraced progressiveism, first in the Wilson Administration, and the more fully in the "New Deal". In the 1970s, it became a full fledged socialist party by purging the heirs of the southern planter class (the "San Francisco" Democrats). 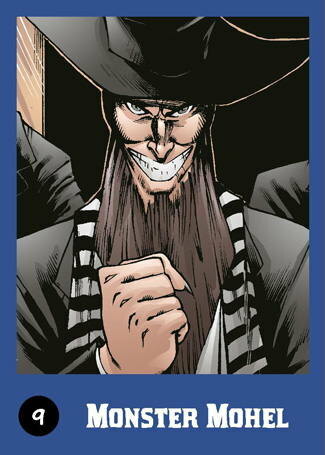 The blood libel comic out of the Gay Bay has a gay element to it also. Shades of Ernst Roehm of the SA and the limp wristed storm troopers.Same devil/different day. Can you celebrate the existence of people in your community who are smarter and wealthier than you? Are you thankful that you live in a society where extraordinary people are allowed to excel and do so, becoming ultra-rich in the process? (Of course it helps to know that the wealth retained by such people is but a tiny fraction of the wealth they generate for your community). If so, then you are free of the virus. If instead you resent the achievement, brilliance and wealth of others and look for ways to bring them down and hobble them, then you fail the Israel Test and you have a bad case of the virus. Yes, the virus is envy, and it's the principle guiding large swathes of the world; especially the Arab world, and western academia. Remember kids, it's the "keep your laws off my body" crowd that are demanding their laws tell you what to do. Because conservatives are so literal-minded too many of us get fooled by the names of organizations. If the founded-by-commies ACLU changed their name to Keep America Free Committe all that would be known about the KAFC would be they want to keep America free. NOCIRC, NOW, ACLU, PETA, NRDC, et al are not about their purported topic of focus. They use their topic of focus as a bludgeon to attack the foundations of America. They are better thought of as anti-liberty Luddites that paint their wooden shoes different colors and with different topics painted on the shoes they attempt to drop into the machinery of America. NOW will persecute women. ACLU will destroy freedom, PETA will kill animals, NRDC will demand pollution. Whatever it takes, however often they need to flip-flop or however "nuanced and sophisticated" their arguments need to be. It occurs to me that Jews, especially Israel, are missing a bet. If they were all that and a lawn chair, as depicted, there wouldn't be any public anti-Semitism because all the filth-spewers would be hiding under the bed in a fetal position. My Dad and his brothers---all 5' 4" or less---used to get beat up daily, to and from school, by Irish youts in the 1920s. Then Pop and his brothers began carrying bats. After breaking knees, the attacks stopped. If Jews responded to attacks not with "Oy Vey!" but with copper-jacketed lead, or lead pipes, I suspect the behavior would stop. Southern James, at this point, I'm hoping there will be some Jews who would be willing to hide Christians in their attics. Once anti-Semitism “infected” Socialism, the possibility of genocide (as opposed to pogrom) became real. Except it didn’t infect Socialism. Anti-Semitism was part of Marx’s intellectual DNA and all varieties of socialism carry it. Haters are going to hate, what are you going to do? If it's not Jews, it's gays, other nationalities, or all Muslims without distinguishing between casual practice and murderous fanaticism. Hate is the virus, unreasoning hate can be directed anywhere, the Jews are the unlucky targets more often than not, but even some anti-anti-Semites are not immune to its effects. Screw it! Sneakers for the Arabs; Guns for the Jews. I have alaways thought the root of anti-semitism is the age old one of one god vs many gods. I think the whole they killed Jesus, economic success, they own banks etc are, in the end, tangential to the issue of one single diety that speaks directly to his people. I think the world in general is still not accepting of that idea. Money is a god, medicine is a god, technology is a god, the earth is a god and on and on. If evil does not destroy the concept of one almighty god, the one the Jews met in the deserts of Sinai, then it eventually loses the battle for man's soul. And the Jews are the poster children for that concept. Strip away everything else and the Jews will be hated for ever because the idea of one god is a fearful one that does not comport to what we see with our eyes around us. This whole *antisemitism* thing is way over done, more so than the pathetic *racist*. People need to get some new material. If the Jews really were Nazis, they'd own the Muslim world from Morocco to the the Indian Line of Control and the last Palestinian would have gone up the smokestack a long time ago. The Jews have been expelled over 100 times from societies they have infested over the last 2000 years. After maybe the 3rd or 4th time you begin to wonder what they are doing to make themselves so hated. Why do conservatives support Israel? It is one of the most liberal countries in the world and they regard conservatives as at best knuckle-dragging neanderthals. Jews in the media and Hollywood gleefully savage everything we hold dear and yet here you are alienating 1 billion muzzies to mollify 7 million Jews. I weep for our party and country.